Dirty air filters are good, as are dirty fuel filters. To a point that is. Most cruisers fixate on the cleanliness of filters, especially fuel and perhaps to a lesser extent air, with good reason. After all, what engine can operate reliably and efficiently if it&apos;s choking for air or starving for fuel, right? Although it may come as a surprise, the answer isn&apos;t a simple yes or no. I was recently aboard a vessel as a mechanic was carrying out an engine inspection. I discussed with him his findings and, among these was a comment indicating that the air filter required replacement. Typically, marine engine rooms are low on dust so air filter elements last a long time when compared to automotive applications. If the engine room&apos;s insulation is disintegrating or if there&apos;s a water leak that&apos;s creating mist then air filter elements do of course succumb to clogging much more quickly. In this case, however, the engines had less than 1,000 hrs on them and the engine room was immaculate, exceptionally well kept. "Why," I asked the mechanic, "are you suggesting that the air filter elements be replaced?" "It&apos;s in the book" he responded, "air filters are supposed to be replaced annually." He pointed to the debris visible in the filter housing window. Appearances, however, can be deceiving. While some debris was visible on areas of the exposed portion of the element, the bulk of the filter surface was clean. While the mechanic&apos;s intentions were good, regardless of these visual observations, the only way to really know the condition of a filter element is to measure the restriction it&apos;s imparting on the system. For air filters that&apos;s quite easy, it only requires the use of a filter restriction gauge, standard equipment on many of today&apos;s engines. The gauge measures and retains the highest vacuum, typically recorded in inches of water vacuum, which can be observed at any time, even when the engine isn&apos;t running. Most OEM gauges include a "change" or red zone indicating element replacement is necessary. Gauges are available for aftermarket installations as well (one vendor for such gauges is Filter Minder, www.filterminder.com ); one can be made to work with virtually any application where an air filter is used. In the case of aftermarket installations it&apos;s important to determine the engine manufacturer&apos;s maximum allowable restriction level, typically it&apos;s somewhere between 12 and 20 inches of water vacuum. Once you know what this limit is I recommend applying a label on or adjacent to the vacuum indicator recording this information for anyone to see during an inspection. Air intake vacuum is measured at full load with wide open throttle for turbocharged diesel engines and at high idle with no load for those relying on natural aspiration. 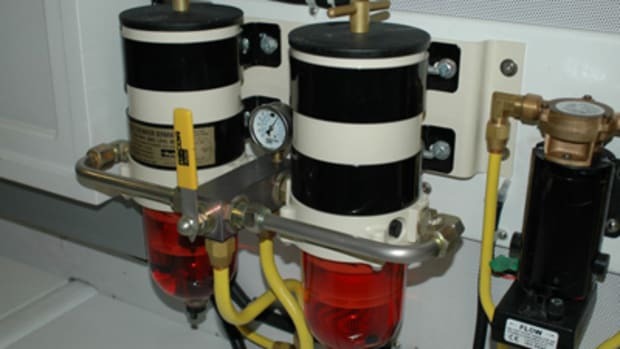 In the case of the average cruising vessel, inspecting the vacuum indicator during every engine room inspection, at least daily when underway, will immediately reveal an abnormally high vacuum reading. Although it may seem counterintuitive, replacement of filter elements based on the number of engine hours accumulated or seasonal may be detrimental to their efficiency and performance. The fact is, whether it&apos;s for engine combustion air, fuel, coolant or even your HVAC system most filters work better after they are "broken in," when they&apos;ve captured some debris. The debris captured in the filter&apos;s element makes it likely that any debris passing through subsequently will be more easily captured. There are other reasons to avoid unnecessary filter replacement. Each time a filter is replaced the risk of entraining dirt or debris into the air intake, fuel or other filtered systems is increased. Additionally, throwing away a filter whose life is not yet over is wasteful, costly and environmentally irresponsible.